EXPRESSION OF THE SCOPE LOCATION- WHAT DOES "LEFT HAND AT 9 O'CLOCK, TIP AT 6 O'CLOCK" MEAN? 1) There should not be a kink in the scope outside the patient's body and the scope should be on one plane as if it was stuck to a flat board. 2) The left palm should always face upward like a tray (Chart 10-2). ROTATION SHOULD BE CARRIED OUT WITH THE LEFT HAND, NOT BY THE RIGHT HAND'S TORQUE. 1) THE SCOPE OUTSIDE THE BODY SHOULD ALWAYS BE ON ONE PLANE. 2) THE LEFT PALM SHOULD FACE UPWARD LIKE A TRAY. In this book the location of the tip of the scope is indicated with hands on a clock. Imagine the tip of the scope is the hour hand of a clock seen by the endoscopist and express its direction, such as "tip at 12 o'clock", "tip at 6 o'clock", "tip at 9 o'clock" and "tip at 3 o'clock" (Chart 10-3). THE DIECTION OF THE TIP OF THE SCOPE IS EXPRESSED AS IF IT IS THE HOUR HAND OF A CLOCK. THE PICTURES SHOW "TIP AT 12 O'CLOCK", "TIP AT 9 O'CLOCK", "TIP AT 6 O'CLOCK", AND "TIP AT 3 O'CLOCK", FROM THE LEFT. Also the location of the left hand is expressed in time. 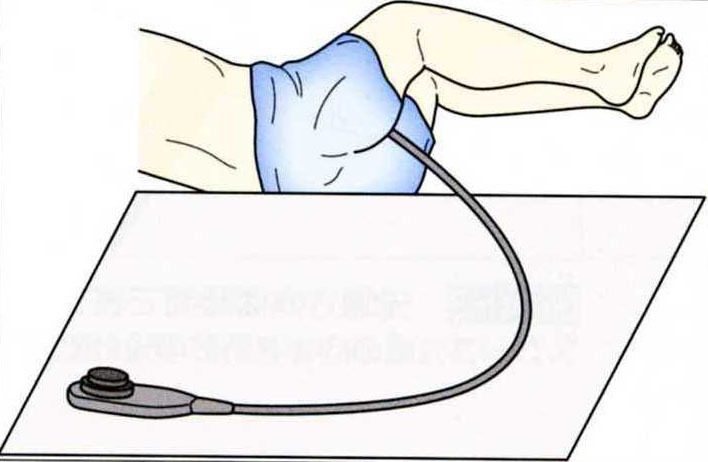 Where the left hand is located when the endoscopist is seen from behind is put into the time as if the left hand is the hour hand of a clock (Chart 10-4). CHART 10-4 THE LOCATION OF THE LEFT HAND IS ALSO EXPRESSED IN TIME. THE LEFT HAND IS TO BE CONSIDERED AS THE HOUR HAND OF A CLOCK. THEN SHOW THE LOCATION AS THE TIME, SUCH AS "LEFT HAND AT 12 O'CLOCK", "LEFT HAND AT 9 O'CLOCK", "LEFT HAND AT 6 O'CLOCK" AND "LEFT HAND AT 3 O'CLOCK". It is of note that "time" is both the one when the endoscopist is seen from behind. For example, the Chart 10-5 shows "Left hand at 10 o'clock, the tip at 9 o'clock". When the left hand is at 12 o'clock, the tip is also at 12 o'clock. This "left hand at 12 o'clock, the tip at 12 o'clock" position refers to as the "home position" (Chart 10-6). Remember the Singular Method starts at the home position and ends at the home position. BOTH THE TIP OF THE SCOPE AND THE LEFT HANDS ARE A HOUR HAND OF A CLOCK WHEN SEEN FROM THE ENDOSCOPIST'S BEHIND. "THE LEFT HAND AT 12 O'CLOCK, THE TIP AT 12 CLOCK" IS THE HOME POSITION.